The Vienna Chamber of Commerce annually honors the most innovative companies in Vienna with the Mercur Award. This year the coveted prizes were awarded again for four categories. 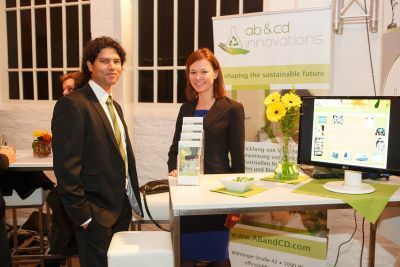 Out of 126 candidates, ab&cd innovations was nominated and made the 2nd place in the category of Green Economy. In the context of a dating café, we presented our innovative project "Production of lactic acid from an industrial byproduct". Afterwards, the award ceremony of all four categories followed. The Mercur Award promotes this year for the 26th time, the innovativeness of Vienna-based companies.